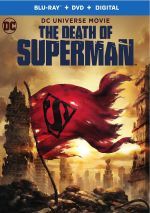 A continuation of the tale started with 2018’s Death of Superman, 2019’s Reign of the Supermen takes place months after Superman’s (voiced by Jerry O’Connell) demise. As society continues to grapple with the Man of Steel’s absence, four new heroes show up in Metropolis. This group includes Eradicator (Charles Halford), Superboy (Cameron Monaghan), Steel (Cress Williams) and Cyborg Superman (O’Connell). All four aspire to replace Superman, and many battles result. Both Death and Reign adapt comics from the early 1990s. As I noted when I reviewed Death, I’d stopped reading superhero books at that point, so these film adaptations became my first experiences with the stories. In the case of Death, I felt less than impressed. While the movie boasted strong visual style, it came up short as a dramatic depiction of events. Though not quite as dramatic in a pictorial sense, Reign functions better as an overall package. It may lack its predecessor’s dramatic visuals, but it manages to create a more consistently engaging tale as a whole. The notion of the “spin-off Supermen” brings a clever twist, and Reign explores the topic well. It doesn’t balance its time among the four especially, as it favors Superboy and Cyber Superman, but it still develops the heroes well enough to make all intriguing. Though Death depicted tremendously dramatic events, it came with an oddly perky tone, a factor that damaged its impact. This becomes less of an issue with Reign, partly because it feels a bit darker in general. During Death, Frederik Wiedmann’s score turned into one of the distractions, as the music undercut a lot of the emotion. Wiedmann returns for Reign and his work feels like a better match for the material. That’s partly because Reign mixes its tonal choices more broadly than Death. We get some serious moments in Reign but it tends toward more of an action romp than its predecessor, and Wiedmann’s music suits this affair in a more logical manner. In addition to good character and narrative development, Reign also comes with a lot of strong action sequences. The battles work quite well and they add dynamic punch to the proceedings. Because I didn’t love its predecessor, I admit I went into Reign with some skepticism. Happily, it overcomes these concerns to create a compelling superhero adventure. Footnote: a tag scene that pushes toward a sequel appears after the end credits. 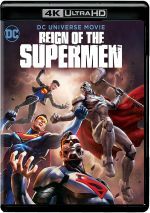 Reign of the Supermen appears in an aspect ratio of approximately 1.78:1 on this 4K UHD Disc. As expected, this became a satisfying image. Sharpness excelled. The movie always came across as tight and well-defined, so don’t expect any signs of softness. Jaggies and moiré effects also remained absent, and the image lacked edge haloes or artifacts. In addition, print flaws were a non-factor and didn’t appear at any point. In terms of colors, Reign went with a fairly bright palette that could lean teal, but it also emphasized primary colors. The tones looked solid within those parameters, and the 4K UHD’s HDR abilities added vivacity to the hues. Blacks were deep and tight, while shadows showed nice clarity. HDR brought out strong contrast, too. Across the board, the image worked well. I thought the DTS-HD MA 5.1 soundtrack of Reign opened up the comic book material in an appropriate manner. The forward channels brought out the majority of the material, but the entire package added a lot to the movie. Music presented strong stereo imaging, while effects cropped up in logical spots and blended well. The surrounds also contributed good information. For the most part, these reinforced the forward channels, but they also contributed a fair amount of unique material. These instances mainly occurred during bigger action scenes, but they spread out in quieter scenes as well and even featured some directional dialogue. The back speakers brought out a nice sense of space and environment. Audio quality always satisfied. Speech was warm and natural, without edginess or other issues. Music sounded lively and full, while effects displayed good definition. Those elements seemed accurate and dynamic. All of this led to a positive presentation that deserved a “B+”. How did the 4K UHD compare to the Blu-ray version? Audio remained identical, as both discs provided the same DTS-HD MA 5.1 mix. On the 4K UHD, visuals showed a boost, mainly due to the superior colors and blacks/contrast from the HDR. Sharpness seemed marginally stronger with the 4K, but the nature of the source limited this growth. Still, the other elements made the 4K an upgrade over the Blu-ray. No extras appear on the 4K UHD itself, but we find some on the included Blu-ray copy, and we get a Sneak Peek at Justice League Vs. The Fatal Five. It fills nine minutes, 29 seconds with notes from producer Bruce Timm, screenwriters Jim Krieg and Eric Carrasco, director Sam Liu, and voice director Wes Gleason. “Peek” gives us basics about story and characters, cast and performances, and related areas. It’s a decent overview, albeit one that exists to sell the new movie. Lex Luthor: The Greatest Nemesis runs 16 minutes, eight seconds and features Liu, DC Entertainment Animation Creative Director Mike Carlin, comic artist Jon Bogdanove and co-director Jake Castorena. As implied by the title, “Nemesis” offers a look at the Luthor character. It works fine for what it is, though I wish it’d delved into Lex’s history and evolution over the years. Two Bonus Cartoons show up, as we find “Heavy Metal” from Superman: The Animated Series (20:52) and “Panic in the Sky” from Justice League Unlimited (23:04). “Metal” appears here because it shares the character Steel with Reign, whereas “Panic” pops up for less obvious reasons. Sure, the Justice League appears in Reign, but that seems to be the only connection. Whatever the case, both shows offer some entertainment value. The Blu-ray opens with ads for Aquaman (2018) and Constantine: City of Demons. Trailers adds clips for Shazam and Death of Superman. Though I wasn’t wild about The Death of Supermen, its second chapter fares better. Reign of the Supermen offers an appealing mix of action, intrigue and comedy to become a solid adventure. The 4K UHD brings very good picture and audio along with a handful of bonus materials. Reign brings us an effective superhero tale, and the 4K UHD brings out the visuals in the best manner possible.